It's no secret that half of team of Developers and Gamemasters have been working on a new core for the past few months. We've needed an update for many years now and we're happy to announce that we've got the base of the new core made! What I mean by base is, it's the part that will be shared among all of our realms BEFORE that realm's own features are added to it. Each realm is different and requires different features for it, like Unlimited for example is a fully custom realm and it will need more custom features than Fallen Heroes who is custom but sticks more to blizzlike standards. What this new core allows us is the ability to update every single realm equally. So if we fix a bug or improve something, all realms will get it and there will be no extra work on the Developers. Nice, right? This is the good part though! The new core also gives us the ability to expand our server with new realms while not ignoring our old realms! How awesome is that!? 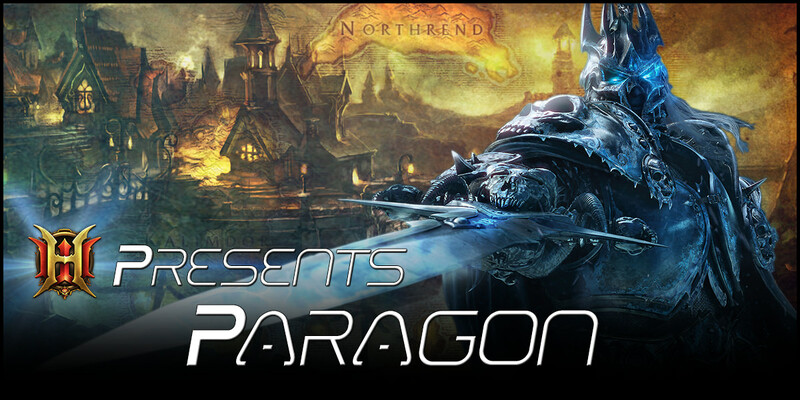 So Heroes-WoW would like to introduce you to our newest realm; Paragon! While our main goal at the moment is to use this realm to test the new core out before we add it to Unlimited and Fallen Heroes, but that doesn't mean this realm is just some "Testing Realm". We have plans for it's future! So please help us usher in a new age of Heroes-WoW content by reading up on our new realm and core. It will benefit our server and it's community in the long run! Let's face it guys, we all know that we needed this kinda update very badly and we'd like to apologize for the long wait on the issues you've reported over the years which is why we decided to take the time and do this all in one go so we can avoid this kinda issues in the future. The realm will be based around being a blizzlike realm with custom content. The starting content is blizzlike and later on the custom content will be infused. Now, before you think this is just an other cliché blizzlike realm, we have always been known for our custom content so rest assured, we will provide custom content. Various custom features will be available throughout all content such as an unique leveling experiencing where the player decides their own rates anywhere from x1 to x100. Just like on our other realms you can expect to see custom content from newer WoW expansions on this one such as new mounts, pets, gear and updated creature displays(Basically it supports our main patch just like all realms do). Paragon will be a realm that is some where between Fallen Heroes(A level 80 cap blizzlike with customs) and Unlimited(A Custom 255 Funserver). It will mainly stick to the blizzlike standard of gear scaling, like Fallen, but unlike Fallen it will increase the level cap periodically as we release new content. Read below for our future plans for custom content. Naturally we will have some custom features that every single realm uses(Transmogs, Cross-Faction, iLvl Progression, etc..) activated on Paragon. Paragon will also have some custom features that neither Fallen Heroes or Unlimited will have as well, and vice versa. The new core is still being tested thoroughly and for this reason, we do not have a set ETA yet. We are, however, making more progress by each day and so far every class has had their spells, talents and glyphs tested and they all work 100%. We will keep you guys updated on the progress we are making throughout the testing process and hope to have an ETA set soon. While this realm will be used as a testing grounds for the new core, it will be a new addition to our realm list. Meaning you'll be able to use your current account to switch to the new realm but everyone will start fresh, there will be no transfer of characters. You'll also be able to use any gold or silver coins you've accumulated. We're planning to release custom content at a much later date. The plans so far are as follows. This is all the custom content we have planned. We're planning to periodically increase the level cap with each new Tier and Season we release. Each time we release new content it will function as a small expansion pack for the realm. Each expansion will include new raids, new questing zones, new level caps, and new pvp seasons. It will be an addition to the blizzlike content already offered, custom but still maintaining that blizzlike balance as best as it can be. It should be noted that plans are not set in stone and are subject to change at any given time. We will do our best to keep everyone up to date with the fixes, changes and progress in this thread. If you have any concerns or questions regarding this update or the new realm, throw a reply our way and we will get to you. We're open to all suggestions for this new realm and core features! Don't be afraid to mention something you would like to see added to either the realm or the core. You never know, we might approve and do it. Such as the Account Wide Mounts feature, this was a player's suggestion! Last edited by Hawjiki; 09-12-2018 at 12:47 AM. I think this is the most unhealthiest decision you have ever done. Not only for the server as a whole but also for unlimited, unlimited is on a wheelchair and you are pushing it down the stairs. Do we not already have a realm like this? Fallen? Also, the core update will fix a lot of issues that you say are on the new realm, this is misleading information as the core is serverwide and not realm exclusive. I have played here for a while and just wanted to let you know what I think of this. (Similar change happened from heroes wow realm which was the original realm, then you released UNLIMITED MEGA FUN realm and killed heroes wow realm). Will probably get deleted but I don't mind at this point.. It clearly states that the core update is a BASE update. As in it is the base of what each realm will be using. So everything has to work default like. Unlimited custom changes will not be changed on the update, how that realm is balanced is not effected by the core at all. At most the core fixes some pre-existing broken abilities for unlimited and some other core side issues, more stable. No devs from Unlimited have been pulled off of it to work on the core. So your concerns about it being pushed down "stairs" is unwarranted, yet understandable. For Unlimited issues you should report them in the unlimited section and hopefully they'll get resolved soon. I'm not entirely sure what they have planned and what I do know I cannot say. It is indeed similar to Fallen. I've explained the plans and the differences that are between the two, or will be. Future plans are for the future and nothing is set in stone. If players desire no custom content, then we can keep it blizzlike, or any other kinda realm. Main point of the realm after it launches will be a blizzlike realm we're using to test out the new core before we implant it to Fallen and Unlimited, as I clearly explained. I don't understand the reasoning for a new realm.... I share the same feelings as you karre. I really think this will spread the dwindling playerbase even more. I hope you guys prove me wrong. Maybe it will only affect fallens population though. Im just confused at having another server like fallen. Also I don't understand listing things like "working classes" and "working instances" as features.... It seems like quite a few things that were put under "features" are just there to make it seem like there's more. Having your classes and instances work shouldn't be a "feature". They're expected to work. It's like selling someone a house and saying "yea man the walls and floor come with it too". Best of luck on the new project. Last edited by lordvolom1; 09-09-2018 at 11:11 PM. Stop being so dramatic. No info given even suggest that it's going to effect Unlimited other than the new core fixen some abilities and such for it. The new realm isn't even remotely the same as a Unlimited's settings and the reason you play Unlimited is for the 255 CUSTOM content. If anything, this will split Fallen's small population until Fallen gets the core update. For those type of realm settings the most common questions asked is concerning the function of classes, their abilities, and the scripts of instances. As everyone is curious to how well things work and thus we list it to avoid answering those same questions. That being said, you people can whine about Unlimited related things by going here https://forum.heroes-wow.com/forums/7-Unlimited . If you have a question concerning the core, how it will effect realms(which has been explained multiple times now and in two different post, or the new realm then feel free to ask them.. Other wise use the proper sections to post your compliments about our already existing realms or suggestions for those realms. Meaning you'll be able to use your current account to switch to the new realm but everyone will start fresh, there will be no transfer of characters. You'll also be able to use any gold or silver coins you've accumulated. So let's get this straight...for people who have full donor chars on unlimited...do they need to start a fresh with all the donating etc to obtain donor items on a new realm? Also a new realm will affect the already dwindling population of unlimited right? The new realm isn't even remotely the same as a Unlimited's settings and the reason you play Unlimited is for the 255 CUSTOM content. If anything, this will split Fallen's small population until Fallen gets the core update. For the first few months of the realm, there will be no donation gear for fairness purposes. Afterwards there will still be no "donor gear only" gear. You'll be able to play and earn the same gear that will be offered, just if you choose to donate you'll be able to bypass most of the gear progress. Well the first "new" character bit of it. Gold coins current plans will be mostly based around special mounts, pets, mid to early end-game tier, same for season gear. You will never be able to buy end-game or end-season gears. Won't be pay to win, but it will still allow you to bypass the grind, if you so choose to donate. As for the custom content and donations related to it. Well we haven't gotten that far into custom content plans yet to consider that, if we even follow through with custom content for the realm. Nothing is set in stone atm other than it's going to be mostly blizzlike(ofc core custom features and our patch will work on it) realm on launch. I agree with them Hawjiki, I am sorry to say it but it truth of why add new realm when your server population is average at best on both realms rather than just focusing on both Unlimited and Fallen. if it was open realm for testing purposes than as community would understand that because test out content before got added to live realms. Adding a new realm honestly doesn't make sense since low end version of both and sadly a lot of features already exist on exist realms. Their a lot things that we could honestly tell you Hawjiki why this isn't healthy decision from many different positions and how much of hurt put on exist realms and as server as whole rather than just sticking to exist realms with population you have right now. Although Core Update on both exist realms is awesome and wonderful to hear and hope I mean hopefully solve a lot of years pass issues that we as community been posting and wanting to get fixed will happen. Their is things that we would like that posted for new realm instead of adding to exist realms like especially Class specific weapons that would make players characters on exist realms feel more unique and powerful right now and would bring more people to play and scaled glyphs and enchantments especially for Unlimited would be so nice also. I mean a lot of stuff that you can do on exist realms that would bring old players back and also new players rather than adding new realm. Hmm, think you typed that wrong but I think I also understood what you meant. Things like Class weapons would only work for realms like Paragon and Fallen, the latter of which will be having its "legendary weapon" system converted into it after the core is implanted on it. On 255, it would not work at all. Stats are too high and players have access to all 3 talent trees. As for your comment about attention being more focused on the other two realms, Unlimited has a dedicated dev team if 3( and half?) devs. Fallen has only one dedicated(Me). Rob works on everything. This core is for every realm as a whole as it improves most issues that Fallen has and fixes some that Unlimited has(this does no include any balancing, Unlimited is a custom 255 server and it requires special need and tweaking when it comes to that) and it is being done so that every realm we have uses the same core so when a fix or feature is added every realm will get it and no one will be neglected or focus pulled off of any one realm to fix the issue. Paragon will have one dedicated dev(me). I don't really know what your concern here is. I'm not stopping my work on Fallen and Paragon, if we do custom content, will not steal any attention away for Fallen or Unlimited. Like I said earlier, if you want to make suggestions for Unlimited then use the proper place to do so. Same for Fallen, if you have suggestions for it I am more than happy to read those and take them into consideration. It is not a lot of work to launch a new realm that is mainly blizzlike(For now). If or when we do custom content for the realm, I am the only dev that will be working on it as I explained above. No focus or attention is lost from either Fallen or Unlimited.